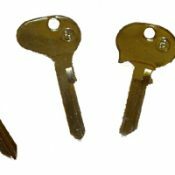 A key for Ferrari cars manufactured between 1960 and 1995 cut to number or photo. Models Include: 208 GTB, 208 GTS, 308 GTB, 308 GTS, 328 GTB, 365 GTB, Dino, BB 512, 400 GT, 412, Mondial 8, GTO, Testarossa, 348, F40. We do not use original Ferrari blanks, we use high quality steel blanks manufactured by Silca.